There is a LOW avalanche danger at all elevations in the forecast zone this morning. The danger may rise to MODERATE this afternoon at the high elevations due to an increase in Northerly winds. If this is the case, watch for shallow wind slabs being formed - up to 6-8" thick. Remember, LOW doesn't mean NO. If you are venturing to the high peaks, finding a fresh wind slab will be possible. This is most likely in the periphery of our forecast area, such as the Portage Valley and Summit Lake regions. Our deepest condolences go out to the family and friends of Dasan Marshall who passed away in a climbing accident on Sunday. Media article is HERE. 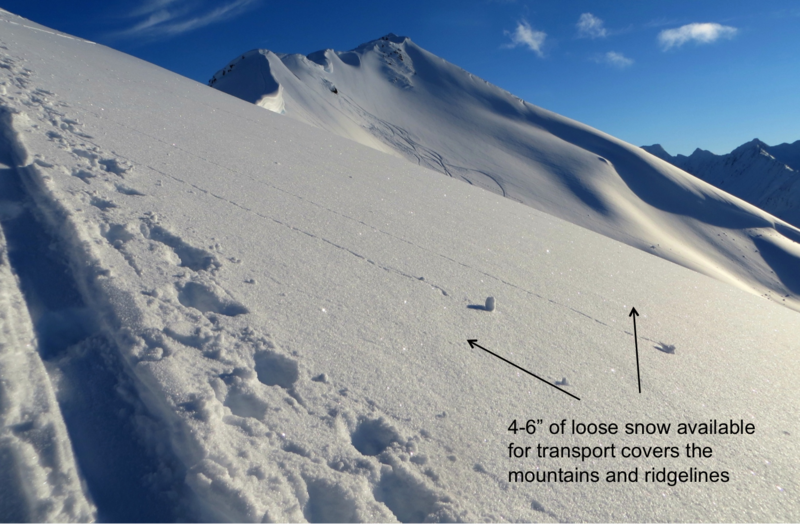 One of the primary concerns in the backcountry remains the challenging approach-to-the-snow conditions from the parking lot. With little to no snow below 1,500', ascending and descending over very slick ice covered ground can get interesting. However, winter does exist in full fashion above 2,500' and quality riding and skiing conditions can be had. There is one potential game changer for later today, however. The wind. Winds are on tap to shift to the North this morning and increase just enough to move snow around by this afternoon. If you are out in the 'winter-zone' today, keep tabs on the winds and know that loading patterns may be different than expected as this is not a typical wind direction. With 4-6" of loose snow blanketing the surface, including ridgelines, there is plenty of snow available for forming soft 6-8" wind slabs. These will be easy to identify as you will likely see them forming or by looking for smooth rounded surface textures. Stiffer feeling snow and cracking is also a sign you have found a wind slab. If slabs do form, they are likely to be relatively small and shallow yet sensitive to human triggers. Glide cracks continue to slowly open across the forecast zone. Limiting time spent around and under these is crucial. Even though it is cold, they are still known to release producing a destructive avalanche - as can be seen in the photo below. Most suspect terrain are unsupported slopes where there is limited compressive support for the slab from below. Eddies is a great example of this as the South face gets steeper mid and lower-slope. 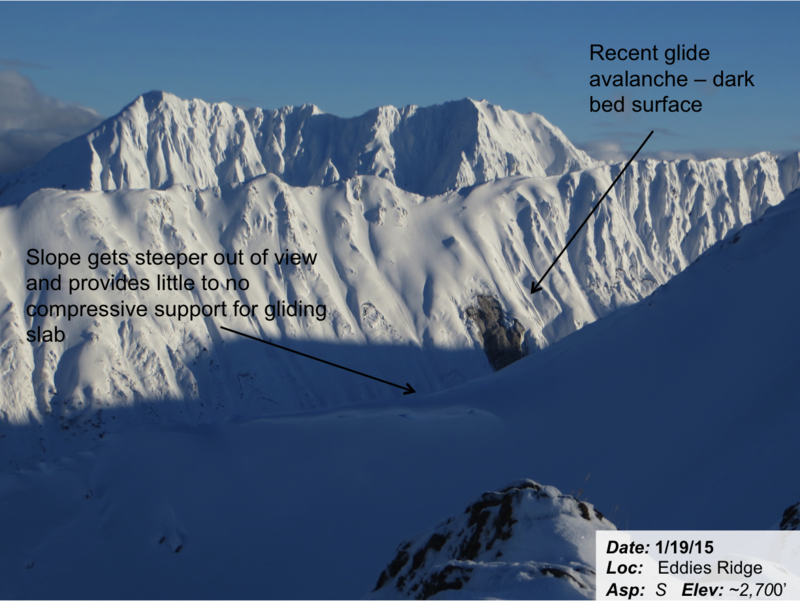 Recent glide avalanche (suspected past 48 hours). Eddies South face, ~2,700'. Mostly clear skies greeted folks in the backcountry yesterday. Mid level clouds were just starting to inch their way in midday along with a slight bump in Northeasterly ridgetop winds, 10-15mph. Temperatures remained cool, ~30F at 1,000' and in the low 20's F on the ridgelines. Today, ridgetop winds should bump up to the 15-20mph range from a Northerly direction. Cloud should also stream through due to a tight low pressure system which is moving north passes us to the East. Temperatures should remain near 32F at 1,000' and in the low to mid 20's F on ridgetops. No precipitation is expeced. A mostly quiet and sunny day is expected for Wednesday while another large area of low pressure rolls in from the Gulf on Thursday. Stay tuned for this next precipitation event.